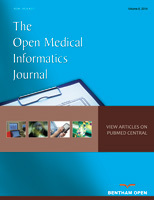 The Open Medical Informatics Journal is an Open Access online journal, which publishes Research, Reviews and Letter articles in the field of medical informatics, aiming at providing the most complete and reliable source of information on current developments in the field. This journal publishes open access reviews on recently published books (both print and electronic) relevant to the journal. Publishers and authors of books are invited to contact our book reviews editor at tominfoj@benthamopen.net with book review requests. All submitted books will be reviewed by an independent expert in the field. No page charges will be levied to authors for the publication of book reviews. Matheson NW. Things to come: postmodern digital knowledge management and medical informatics. J Am Med Inform Assoc 1995; 2: 73-8. Pan Y, Pylatuik JD, Ouyang J, Family AJ, Fobert PR. Discovery of functional genes for systemic acquired resistance in Arabidopsis thialiana through integrated data mining. J Bioinf Comput Biol 2004; 2: 639-55. Riggs AD, Porter TN, Overview of epigenetic mechanisms, In: Russo VEA, Martienssen RA, Riggs AD, Eds. Epigenetic Mechanisms of Gene Regulation. Cold Spring Harbor Laboratory Press, Cold Spring Harbor, NY 1996; 29–45. Bower JM, Bolouri H, Computational Modeling of Genetic and Biochemical Net-works, MIT Press, Cambridge, MA 2001. Monteleone R, Auer JE, Gilman P, inventor; Draeger Medical Systems, Inc., assignee. System and method for navigating patient medical information. United States patent US 7165221. 2007 Jan.
All authors must strictly follow the guidelines below for preparing illustrations for publication in The Open Medical Informatics Journal. If the figures are found to be sub-standard, then the manuscripts will be rejected.